Berenice Abbott (July 17, 1898 – December 9, 1991),née Bernice Abbott, was an American photographer best known for her black and white photography of New York City architecture and urban design of the 1930s. What the human eye observes casually and incuriously, the eye of the camera... notes with relentless fidelity." ...people say they need to express their emotions I'm sick of that. Photography doesn`t teach you to express your emotions it teachs you to see. Today we are confronted with reality on the vastest scale mankind has known [and this puts] a greater responsibility on the photographer. The work of Berenice Abbott (1898-1991) played a decisive role in the history of photography and offered a new way to understand its language. She helped to relieve the medium of any comparison to painting; photography started to exist independently and according to its own characteristics. 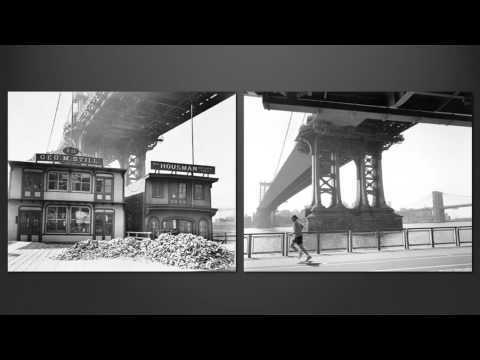 Is This Berenice Abbott Shooting One of NYC's Most Iconic Photos? Almost everybody knows Berenice Abbott's famous "Night View, New York" photograph. It's Manhattan in a nutshell—a solid wall of city, cold and bright. But we've never known the whole story behind this definitive image. The work of Berenice Abbott, who photographed Depression-era New York, is featured in a new exhibition at Toronto's Art Gallery of Ontario and an accompanying book. Avant-garde artist Berenice Abbott is famous for her shots of New York skyscrapers – but she also developed an all-new kind of scientific photography. She exposes her delicious memory. She is a chess game between light and shadow.